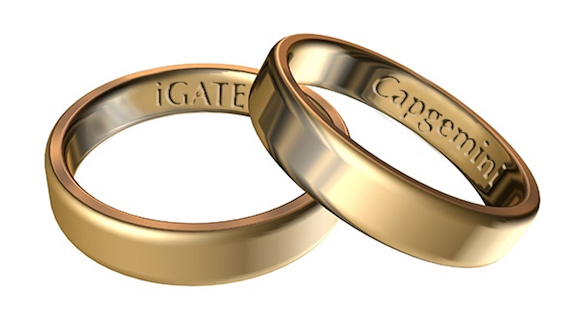 As we correctly predicted last week, Capgemini and iGATE have announced their nuptials after finding many areas of common interest to consummate a long-term flourishing relationship. In short, this merger further builds on our weekend argument that service providers need to blend the best parts of each other to address better the journey to the As-a-Service Economy, and not solely the really disruptive stuff that could be 5-10 years out on the horizon. OK.. there's more chance of me being the next Gartner CEO than IBM actually buying TCS, but we wanted to set out the argument why a bout of lovely big service provider marriages could provide an ideal distraction from the spate of depressing quarterly results, while allowing for them to co-develop their investments in areas of real value. At HfS, we believe this acquisition makes a lot of sense for Capgemini to address several holes in its global service portfolio, shoring up its India presence and adding some serious pep to its US clientele (and brand), financial services capabilities and analytics depth. iGATE derives over 70% of its revenues from North America with anchor clients such as General Electric and RBC and particular strength in financial services and manufacturing. By contrast, Capgemini gets around 20% of its revenues from North America with the stated intention to grow that very significantly and rapidly across the services portfolio. Capgemini has worked hard over the last few years to build its presence in India starting from the acquisition of Kanbay back in 2006. Today it has 55,000+ FTEs in India as compared to 30,000+ at iGATE. The iGATE delivery footprint may be especially interesting to Capgemini who have been trying to grow their presence in Tier II cities in order to reduce labor costs and iGATE may be an accelerant to this effort. Through its Business Intelligence, Extract Transform and Load and Enterprise Datawarehouse work, iGATE has penetrated into some really large accounts in industries like quick service restaurants, and is now moving up to higher value analytics work for these same clients. This would bolster Capgemini’s already strong BI and analytics practice, particularly with US client, and add ~2500 analytics FTEs, which is always a plus. Capgemini has historically been a horizontally-oriented BPO service provider with a comparatively limited vertical capability, offering a proven market leading F&A capability, but less impressive in industry-specific BPO areas. iGATE brings real depth in financial services vertical BPO, especially insurance, where the firm been making investments for the last several years as a TPA and a provider of transactional services For example, iGATE has also recently opened a center of excellence for insurance BPO in Dartmouth, Nova Scotia, a first class delivery location for higher value work, and is very active in embracing onshore/nearshore talent to supplement it's offshore delivery engine. iGATE would also bring vertical business processes (with analytics) in other verticals such as healthcare and life sciences, which would also compliment Capgemini's growing needs. This was was one of the key ‘emerging services' areas for Capgemini in the last couple of years, and HfS believes it wanted to build particular depth in domain-specific regulatory compliance services for financial services. iGATE’s client footprint in financial services may be an accelerant for these efforts. iGATE can complement the Capgemini's Engineering services practice which is oriented significantly towards aerospace and utilities clients. By contrast, iGATE engineering services serves medical devices and mining clients including several marquee clients. However this is still a small offering out of the grand total and so it is unlikely to be a significant source of strategic benefit immediately. Everytime I try to type "iGATE" I have to double-check where to put the capital letters. Thanks for erasing this headache! Capgemini is making strides bringing Process Automation into especially its BPO operations but so too are their competitors especially in Cognitive where the Capgemini vision isn’t clear today. We like what they are doing in process automation but iGATE isn’t going to be a force multiplier to this capability and in fact the integration may distract the team from making advances in this critical investment area today. Most of the leading service providers today are looking at niche buys that specifically add software IP or a vertical capability, such as Cognizant/Trizetto, or Infosys/Panaya. However, in Capgemini’s case, there are still some significant holes in its portfolio to fill out, most notably a more powerful presence in India, a stronger portfolio of US enterprise clients, and a deeper foothold in financial services. iGATE brings these to the table. Net-net, we applaud the boldness of this move, and hope, for Capgemini’s sake, the French mothership can integrate the two firms effectively. However, we also hope Capgemini can quickly focus on some specific niches that have real As-a-Service elements so them, such as strong analytics depth in discrete functions, and further industry vertical strengthening. In addition, we are still awaiting the firm to pack its punch in automation and cognitive, where it is beginning to talk a big game, but needs to demonstrate some real investment plans. It is really big news and will have a serious impact on the IT services industry especially TCS, CTS, Infosys and likes and of course Accenture, IBM, Deloitte too. Good mix of india centric/offshore centric IGATE with European Centric Cap Gemini. Would be a marriage worth a watch. Agree, good points. Clearly the issue for Cap is the sub-par India story and traditionally soft US market traction. The 4B$ number is definitely a very big exit for iGATE/APAX Partners and very timely for them, the company perhaps would have struggled to grow ahead meaningfully given its challenges in sales and otherwise. US growth: Cap US will be the primary owner of iGATE now - clearly the classic, old style India story and pricing model will apply straight to US customers. Make bids even more competitive than the CG India engine - hopefully they can grow there now The financials: Cap Gemini seems to be facing pressure on both its growth/topline and margins visavis some of their India and traditional competitors, not to mention their market cap is only 13B (? ), they have to grow faster and improve margins sooner than later The Europe based competitors: Moves of some of their competitors, for example ATOS - Xerox and bigger US competitors in general. iGATE will not be an immediate fix of course but is a strategic step in that journey. Now they got to make it work in a time when there is the whole shift to the Services direction in the sector as a whole. Capgemini-IGATE stole all the attention from Infy buying Kallidus. Phil, any thoughts on that one ?